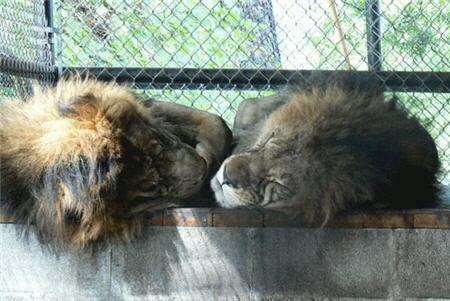 We rescued Dinari and his brother, Malikai, from a dilapidated roadside zoo in 2002. 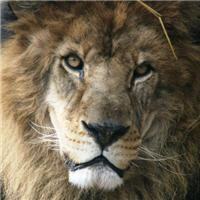 Dinari lived in a crowded cage with 6 other lions which was covered with cloth and offered insufficient shelter. His only toy was a ball that sat inside of an empty rubber water dish. Since there was no running water or electricity, many of the animals had no fresh drinking water. 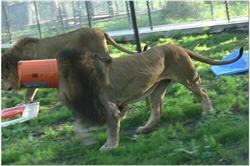 At meal time, the keepers would throw food over the fence leaving it up to the lions to claim their own portion. 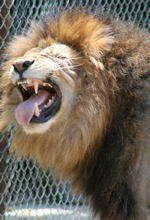 Dinari, who was a young lion at the time of his rescue, was housed next to adult tigers who pulled his paw through the fence, dislocating his elbow. Since he did not receive proper medical attention, the injury did not heal properly and he now sports a lumpy mass on his elbow and a scar across his toes. He suffered from coccida and a number of worms. Initially, we were told that Dinari was about 10 months old and around 100 lbs, but much to our surprise, we discovered he was actually about 15 months old and close to 200 lbs at the time of rescue. With proper medical care, a nutritious diet, lots of love and enrichment, Dinari is now a happy, healthy, full-grown lion. He loves playing and cuddling with his brother and romping around in his huge playground. He loves catnip in a bucket, and to the surprise of many, loves playing in his pool. When he really wants your attention, he will sit up on his hind feet and clap his front paws together.